Once upon a midnight clear, there was a child’s cry, a blazing star hung over a stable, and wise men came with birthday gifts. We haven’t forgotten that night down the centuries. We celebrate it with stars on Christmas trees, with the sound of bells, and with gifts. But especially with gifts. You give me a book, I give you a tie. Aunt Martha has always wanted an orange squeezer and Uncle Henry can do with a new pipe. For we forget nobody, adult or child. All the stockings are filled, all that is, except one. And we have even forgotten to hang it up. The stocking for the child born in a manger. It’s his birthday we’re celebrating. Don’t let us ever forget that. The story of Episcopalian Bishop and the problems he is having in trying to balance family, the normal pressures of his job, and the added pressure of trying to build a cathedral. In desperation he makes a prayer for help. Enter an angel named Dudley played by Cary Grant. Which is good because Dudley does want to help. 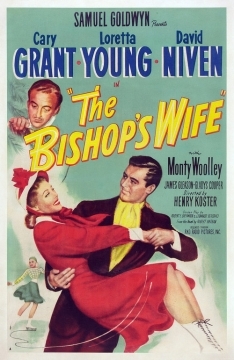 It’s also bad because Dudley is a bit attracted to the Bishop’s Wife…and well if being an angel wasn’t enough, it’s an angel played by Cary Grant…how much do you want to bet it was not entirely platonic feelings on the side of the Bishop’s wife (not that she would even consider cheating on her husband, but even she observes that this “something wicked” in the time she spends with Dudley). One of the Bishop’s other problems is the rather vicious rich old woman who has the money he needs to build the cathedral but is demanding unreasonable and selfish concessions for it. And they’re not subtle about how much we should dislike this woman. In one of the first scenes she is openly hostile to the Bishop’s dog…in movies as in real life, if you don’t like dogs you’re as evil as it gets (I understand if you’re not a dog person…but to openly dislike dogs is about as clear a sign as I can see that you don’t have a soul.) But put her in a room with an angel and even he can melt her hard heart. She is only one of the people whom Dudley’s company alone brings them back to faith and redemption. But this is only one of a multitude of miracles that Dudley performs in the movie. (I really tried to find footage of him decorating a Christmas Tree in only a few seconds but it doesn’t seem to be up on YouTube…go watch the movie, it’s a nice scene and decent special effects for a 1947 movie). For all the headaches he gives our dear Bishop, he does his job and leaves when his role has been finished…although maybe not in the way expected. I can think of no movie that more clearly and beautifully states the theme and purpose of Christmas than these words. And it is this beautiful sermon that raises it from simply a great film to the greatest Christmas film yet made. Besides the fact this movie has Capra’s usual bizarre caricature of rich people (anyone with Potter’s attitude and traits would not stay wealthy for very long let alone George Bailey’s entire life) this is a great film. Long before cheap sci-fi took up the concept of the butterfly effect, this story asked how much do we affect the lives of those around us. And George Bailey seemed, even in his less happy moments, to always be a force for good in life. If I really have to summarize the plot for you…well, that’s just sad. If you haven’t seen this movie go out and see it right now. The point you are supposed to get out of this film is not only that life is precious and worth living, but that we all improve the world around us. Every little choice, when made with the right frame of mind, looking for the long term rather than the short term (as George did in trying to stop the run on his bank), thinking of others equal to how much you think of yourself, of standing up for what it right and opposing what we know to be wrong, and forgiving ourselves our mistakes when we are less than perfect—every little choice affects the lives of others in ways we can never see and with results we can never know. Now, the very lives of everyone in the town we live in probably doesn’t depend immediately on what choices we make…or at least we think it doesn’t…but does it need to be a whole city before we worry about our choices. What if the choices we make only affect a dozen, or half a dozen, or even only one other person (although I doubt any of us have such little impact)? Even if only one, think about the power that our choices have, think of how much we are worth if we can make the world better for only one other person. Let me go off on my New Age tangents for a second. An often overlooked point of George Bailey’s life is how important his antagonist, the cartoonish Mr. Potter was. 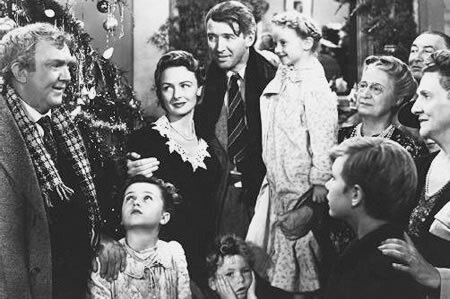 Without Potter George would have left Bedford Falls, he would have gone to college, probably been a mid-level architect, never married Mary, never been the person who fought to help those around him, never been the great man he was. Destiny put in his path a force that would bring out the best in him rather than let him steer toward the mediocrity of what is considered success by the standards of the hoi polloi. So next time you run across someone you really hate…ask yourself, have they been placed there to bring out something good in you…and are you letting that good portion come out? On the other hand, while not a major point, I just need to point out that this movie perpetuates one of the worst spiritual lies of all time. It suggests that humans become angels when they die. I believe angels do exist, but in no religious or serious spiritual belief on Earth have angels ever been human. Angel: Buffy, please. Just this once… let me be strong. Huh? Buffy? Christmas? Has the Conservative New Ager gone more insane than usual? This episode was called “one of the most explicitly religious hours of television ever aired” by the entertainment editor of The Weekly Standard…so clearly I’m not the only Conservative who thinks this. (There is a fascinating lack of YouTube clips to choose from so I will quote liberally here). But why is it a Christmas story. Well, for starters it takes place on Christmas Eve. But a lot of TV shows have their cheesy, shallow, lip service Christmas episode…why does this one stand out. Well first of all because, like most Buffy episodes it’s not cheesy or shallow. Look, I’m weak. I’ve never been anything else. It’s not the demon in me that needs killing, Buffy. It’s the man. […]Am I a thing worth saving, huh? Am I a righteous man? The world wants me gone! Buffy: What about me? I love you so much… And I tried to make you go away… I killed you and it didn’t help. And I hate it! I hate that it’s so hard… and that you can hurt me so much. I know everything that you did, because you did it to me. Oh, God! I wish that I wished you dead. I don’t. I can’t. Angel, the vampire with a soul, taunted by a tarted up version of Satan, is tempted to lose his soul…Angel instead tries to kill himself by waiting for the sun on Christmas morning. Convinced the world is a better place without someone as flawed as him. The words of his beloved Buffy cannot convince him otherwise…and that’s where that quote I put at the beginning of this blog picks up. Because, in what may be the only sign in the Buffy universe that there is a benevolent God, a Christmas miracle occurs. A freak snowstorm blotting out the sun in a California beach town that had only been in the high 70’s the day before. Why is this a Christmas story? Because the Christmas story is one about how each of us is worthy of redemption and can make amends. It’s a message that there is good in all of us, even when we ourselves might not see the good. And it is a story about the fact that God wants us to find that good in ourselves because he definitely believes in us. And that is shown in this episode which is probably the best episode (top 5 at bare minimum) of this wonderful TV show. First off, not everyone that reads my stuff is going to like this post. However, I’ve recently been negative towards Ted Cruz, and many people have questioned why I feel the way I do towards him, or have accused me of demonizing the opposition to boost my own candidate. A lot of people won’t agree with this post, and that’s alright. I write to put my opinions out there, and if people don’t agree I encourage dialogue. I love that we all have differing opinions, and while I may harshly criticize some of those differing opinions, I still encourage discussion.